The following year, 3GPP LTE Rel. 9 expanded on the functionalities of Rel. 8 with features like Closed Subscriber Groups (CSG), Self-Organizing Network (SON), location information services, and Multimedia Broadcast and Multicast Service (MBMS). Breaking Through to LTE-A (4G)LTE-Advanced (LTE Rel. 10 and beyond) was the next milestone in mobile network standardization. With the rapid spread of smartphones and tablets, the exponential growth in data and control traffic necessitated further enhancements to LTE Rel. 9. The next level of system performance needed to be achieved, while also maintaining backwards compatibility with legacy devices, as well as 2G and 3G network infrastructure. ITU-T announced new requirements for radio access interface technologies and specifications. LTE-A networks have been deployed in several markets worldwide. New features like non-contiguous spectrum usage and higher downlink bandwidth are constantly pushing the requirements for capacity and performance to new heights. 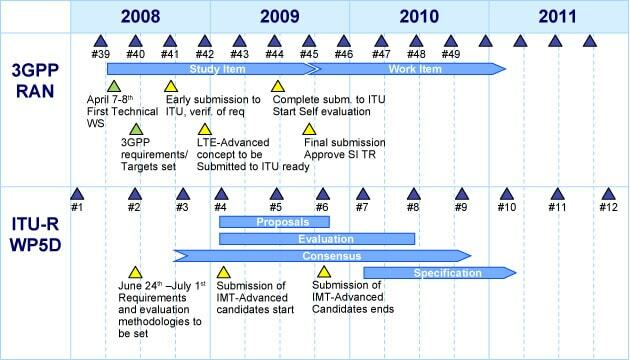 Results of 3GPP Evaluation Against ITU-R Technical CriteriaITU-R has specified minimum requirements and evaluation criteria for IMT-Advanced (4G) in the eight technical areas listed below. 3GPP TR 36.912 V9.0.0 (2009-09) describes the detailed evaluation results comparing 3GPP Rel. 10 to ITU-R technical criteria. The 3GPP self-evaluation concluded that LTE Rel. 10 & beyond (LTE-Advanced) SRIT (Set of Radio Interface Technologies) and the component FDD RIT (FDD Radio Interface Technologies) and TDD RIT (TDD Radio Interface Technologies) elements met the technical criteria, and should continue through the decision making process for inclusion in the ITU-R IMT-Advanced terrestrial component radio interface recommendation(s).